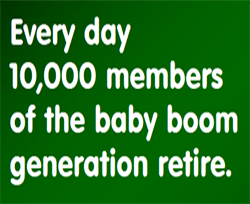 Each day 10,000 members of the baby boom generation retire. It’s a steady, lockstep march of newly-arrived retirement age Americans that will continue unabated for the next nineteen years. Unfortunately, nearly half of today’s workers seriously doubt their ability to retire comfortably and a record number of Americans – more than a quarter – have pretty much given up on the idea of ever achieving anything close to what previous generations would call a comfortable retirement. 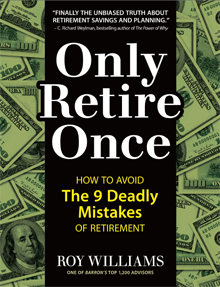 Retirement planning expert Roy Williams shows his readers how to escape joining such a sad and sobering statistic in his book Only Retire Once: How to Avoid the Nine Deadly Mistakes of Retirement. First, by insisting on a strict adherence to a reality-based view of what retirement living really costs. And second, by constructing a careful cash flow management plan based on a reasonable return on assets along with an appropriate use of tax and estate laws to minimize retirement tax burdens and maximize the legacy passed along to heirs. Only Retire Once begins with the most practical questions – when, how and where to retire? It asks its readers to discard the commonly held idea that expenses will be less in retirement – the truth is, your expenses will be at least the same and likely more. Next, the author challenges our tendency to avoid thinking about life’s curve balls and how the unexpected might impact our best-laid plans. Whether it’s a major unanticipated health care cost, or providing financial assistance to a child or other family member, or a child returning home to live while the economy improves, Roy advises his reader to abandon any assumption that includes “That won’t happen to me.” Instead Roy insists that his readers take off their proverbial rose-colored glasses and assess what might happen with their eyes wide open. Roy also uses his considerable tax and legal expertise to provide essential advice on estate and legacy planning. Even if your estate is moderate, his tips and techniques will ensure that your heirs benefit from the smart decisions you make as a result of reading Only Retire Once. Woven throughout the book’s practical and timely advice are engaging stories that illustrate the book’s main concepts and recommendations taken directly from Roy’s vast client experiences. In the end, Only Retire Once is a book designed to deliver on its promise. Follow the author’s practical, well-tested advice and avoid the nine deadly mistakes of retirement. Then, when you do finally decide to leave the working world behind for good, that’s exactly what you’ll be able to do – retire once without any return engagements.